As you know one of my goals for the year is to buckle down and get serious about investing. That’s why I am so glad to have a guest post from an expert on the subject, Troy. 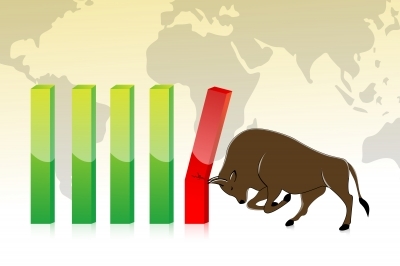 If you want to start investing in 2014 here’s how to get started investing in this bull market. I, on the otherhand, thought the U.S. stock market would crash 15% in the 2nd half of 2013. Turns out, I was dead wrong, and my friend is a whole lot wealthier this year. But that doesn’t mean a huge 20 year bull market is indeed upon us. Yes, this is a bull market, but not one that’ll last for 20 years. Not that this matters to me anyways – I’m more of a trader than an investor. When my market views are wrong, I simply correct my mistakes and reverse thrusters 180. In this post, I want to explain how to get started investing in this bull market. Let’s start with some background. This bull market started in March 2009, which was the bottom after the 2008 stock market crash. Since then, generally speaking stocks have been in an upwards trend (aka a bull market). However, this bull market has been called by some of the world’s greatest investors, traders, and fund managers as “history’s most hated bull market“. Why, you might ask? Isn’t a bull market always a good thing? The answer is “no”. The bull market from 2009 to early 2012 was totally irrational. This bull market didn’t make sense! A typical bull market requires a kickass economy that’s growing nicely. During this period of time, the U.S. economy sucked (tell that to the unemployed). No serious investor actually believed in the bull market. That is why in 2011 and 2012 the S&P500 (a U.S. stock index) experienced brief bouts of market panic (quick 20% market crashes). So what was driving the U.S. stock market? The Fed (grrrr). The Federal Reserve (America’s central bank) pumped massive amounts of money. In other words, the Fed (short form for Federal Reserve) was kicking the stock market upwards. In this world, we have what are known as “self-fulfilling prophecies”. If you tell a person a lie a thousand times, it becomes truth (or at least the person believes it to be true). Same thing exists in the stock market. With the Federal Reserve pumping up the stock market from 2009 to 2011, eventually enough Average Joe investors piled on this “fake” bull market to make it a very real bull market. Hurray for government! Believe it or not, the U.S. stock market is not at the beginning phases of a 20 year bull market. Unemployment is just way too high. American innovation just ain’t what it used to be (see the 1980s and 1990s). We are closer to the end of this bull market. Right now, the U.S. stock market is in a bubble (aka unsustainable high prices). How do I know? Because stock valuations compared to corporate earnings are just way too high! But that doesn’t mean the bubble is going to burst right now – a bubble can last for years. The “smart” guys who recognize that this is a bubble and sell all their holdings. They anticipate a stock market crash, which unfortunately to them, takes a long time to materialize. The “dumb” guys who truly believe that stock prices will go up forever and ever and ever. Once the bubble does burst and the stock market crashes, these investors will lose their shirts (but not their pants 😛 ). Investors who recognize that the stock market is in a bubble but who still buy stocks. These are the truly smart investors who are anticipating when the stock market will crash. They’re looking for signs that the U.S. economy will face trouble. Until then, they remain bullish and ride the bull market’s massive profits. We want to be the 3rd type of investor. In crazy bull markets like this, the best thing to do (I never thought I’d be saying this) is to just buy and hold. Because of the market’s inherent strength, even a decline of 5% is unlikely. Whenever the market falls a little, stupid new bulls will “buy on the dip”. We too want to buy on the dip, but we must watch out for stormy weather. Ultimately, all bubbles end in disaster. So the question is, how do you know if disaster is going to strike? The stock market always lags the U.S. economy. In 2006, the U.S. economy was already facing some major headwinds (see the real estate crisis). But the stock market kept going up for a full year until it finally reversed course in 2007. So until you see that the U.S. economy is facing some very obvious problems, just buy and hold! At the moment (this is January 1 2014), the U.S. economy is killing it. No clouds in sight. Investing in this kind of bull market is just that simple! Don’t get caught up in the europhia – stay alert and aware. Instead of being what us traders call a “pig”, be an “alert pig”. Thanks for reading guys! I’m Troy from Ghost For Beginners. I trade for a living, and when I’m not snowboarding in the winter for fun, I like to try out different computer software. At the moment, I’m testing out a new blogging platform (kind of like WordPress) called Ghost. So if you want to check it out, head on over to my site (link above) at Ghost For Beginners. No affiliate links, ads, or any of that stuff. Just good solid tutorials on how to set up, use, and publish blog posts with Ghost. See y’all next time, and a happy New Year to everyone! Great post. I think your advice to buy and hold right now is solid. I wish we had a crystal ball to see where it’s going from here on out- I agree that there don’t seem to be any clouds in sight, but it also doesn’t seem likely that this will last whole lot longer because it is such a different bull market, as you point out. Yep, definitely the weirdest bull market in history. As Northman (a trader on Twitter) pointed out, this is the first time all the Central Banks around the world have collectively devalued their currencies via money printing. Definitely an interesting analysis. I didn’t realize the stock market continued to rise for a year after the housing crash began. I don’t think it’s terrible to be investor #2. They don’t necessarily advocate selling everything and sitting in cash, but instead look for opportunities elsewhere that will thrive or at minimum grow during a recession. Obviously need more than just a comment form to discuss this haha but I generally trust Peter Schiff’s economic analysis (and subsequent investment advice). Personally, I like Bill McBride (from Calculated Risk Blog). His thoughts on the U.S. real estate market are superb (the guy has a great track record). I don’t bother with trying to analyze the markets, and simply dollar cost average with rebalancing the AA every so often. But love hearing how others are trying to get in and out at the right time. Best of luck! Stock market is forward thinking by 6 months, GDP was at an all time high 2nd 2007. The crash was irrational as stocks were pricing in a depression. Profits today and GDP is 15% higher than Q 2007, stock prices today are 15% higher than 2007. Everything except unemployment is at an all time high.They said it’s because of zero rates, well the last bull market had falling interest rates. People love to revise how they saw 2009 as a buying opportunity yet most barely invested.